Seated atop the Prudential Tower in Boston, the Top of the Hub restaurant provides the ultimate romantic dining experience mostly due to its breathtaking view of the skyline. Top of the Hub is a multi-award winning and multi-featured restaurant. Some of its prominent awards include Best Romantic Restaurant by The Boston Phoenix, Grand Prize for the Professional Pastry Guild competition in New England, Best View by Boston Citysearch, a Great to Be Here voted location, and many others. This highly-elevated restaurant has also been featured on television networks such as the Food Network, BBC, the Travel Channel, and the Discovery Channel. With 190 seats, Top of the Hub is a restaurant/lounge serving lunch, dinner, late dinner, and Sunday brunch. They have a separate menu for each of these. The cuisine is largely comprised of traditional local New England pickings, with a slight influence from Asian and Californian cuisine. This means classic shellfish, lobster, steak and other meat dishes which are famous in the region. Some noteworthy dishes are the Crème Brule; a classic dessert done masterfully by Top of the Hub chefs; Crab Louis, a cold crab and meat dish; and Grilled Tenderloin Beef au Poivre, succulent and tender with asparagus toppings. Customer reviews have been mixed in regards to the quality of the food. Many agree that the food is not really way up there when compared to the ambience and view, and especially because of the prices. The food is acceptable, but often does not completely meet customer expectations of this highly regarded restaurant. The drinks have been described as overly expensive, and, depending on your taste, too strong. Of course, some people appreciated the strength of the drinks while others felt like they were drinking lighting fuel—all a matter of taste and preference. As for the service, reviews were also mixed. There were some reports of people having difficulty in placing a reservation, and a few reports of guests asking to be seated near the windows and having problems with these requests. Also, experiences vary greatly from having super attentive and courteous wait-staff to a waitress blatantly stating that she couldn't wait to get out of there. One supervisor was also reported to be overly impatient with a few guests who were touring the restaurant grounds for the view. Those experiences appear to be one-time events, probably due the restaurant being overly busy. All in all, management should aim high because in the hospitality industry, the most important goal is to receive impeccable feedback on customer service. Even with mixed reviews on the food and customer service, all customers generally agree on one thing: The View is Spectacular. The vantage point from Top of the Hub is absolutely gorgeous, even trumping views from the Sky Lounge, located in the center of the building. 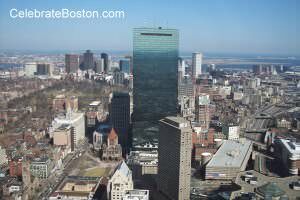 The superb view of Boston adds great value to the restaurant, and a must-visit for tourists that can afford it. The decent food and inconsistent service is made up for by the great views, ambience, and live jazz band featured in the late evenings. Please note that Top of the Hub does not rotate, which is a frequently asked question by tourists. Several reviewers commented about the great view and mused, "I was waiting for [the restaurant] to rotate." Many people make reservations near dusk, which allows watching the sun set from this unique vantage point. As a final note, there also three rooms available for private functions, which are collectively known as the Fenway Rooms.